Jerusalem artichokes, often called sunchokes, are a root vegetable that is eaten and prepared much like potatoes. Because Jerusalem artichokes are less starchy, many people who are trying to cut back on carbs prefer them over potatoes. Jerusalem artichokes are very easy to grow. Some may consider them too easy to grow. A common remark from gardeners who have grown this veggie is that you only have to plant it once and you'll have it forever, no matter how hard you may try to get rid of it! Jerusalem artichokes will provide a hearty harvest and tall yellow flowers with little to no effort. Jerusalem artichokes will grow well just about anywhere. You can grow them in any climate, in full sun to partial shade. They are perennial in all zones. Jerusalem artichokes aren't fussy about soil; they will even produce fairly reliably in clay soils. They do grow best in loose, fertile soil. Because Jerusalem artichokes are perennial, you'll want to give them their own spot in the garden. They grow tall, so be sure to plant them in an area where they won't shade the rest of your crops. The north side of a bed would be ideal. Jerusalem artichokes can be planted in fall, or in spring six to eight weeks before your last frost date. Either way works fine. Make sure each tuber you'll be planting has at least one "eye." Plant them three inches deep and about a foot apart. They work well either planted in rows or in blocks. If you have the room, you can dedicate an entire bed to Jerusalem artichokes. When they bloom, they will look beautiful. There is not a lot of work to grow Jerusalem artichokes. Keep the bed weeded early in the season when the plants are small. Mulch with three to four inches of organic matter. Less coddling (less amending of soil, less watering, and no fertilizing) seems to help keep them under control. Using these methods, they may be less invasive in the garden. Pests and diseases are pretty much a non-issue for Jerusalem artichokes. The biggest problem you'll have will be keeping them under control. Thorough harvesting each fall will help. You're unlikely to harvest all of the tubers, so you can count on having them every year. 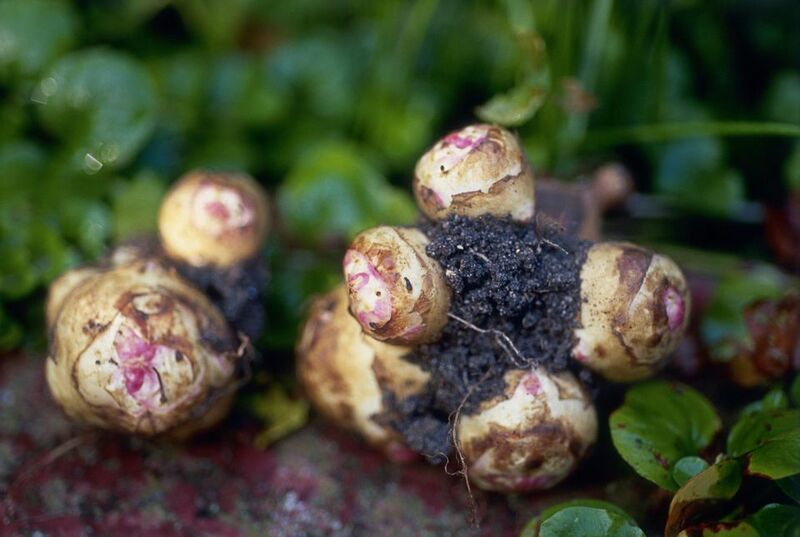 Even the tiniest piece of tuber will grow into a plant and produce more tubers the following year. Dig Jerusalem artichokes, preferably with a digging fork to avoid cutting tubers as you try to harvest them. You can harvest them anytime, but Jerusalem artichokes are much sweeter and more flavorful after a frost or two. You can dig them anytime as long as your soil isn't frozen. To extend your harvest, add a thick (12 inch) layer of mulch after your first frost. This will keep your ground from freezing, buying you a few more weeks to harvest your sunchokes.